Surely the most celebrated Belgian artist of the 20th century, René Magritte has achieved great popular acclaim for his idiosyncratic approach to Surrealism. To support himself he spent many years working as a commercial artist, producing advertising and book designs, and this most likely shaped his fine art, which often has the abbreviated impact of an advertisement. While some French Surrealists led ostentatious lives, Magritte preferred the quiet anonymity of a middle-class existence, a life symbolized by the bowler-hatted men that often populate his pictures. In later years, he was castigated by his peers for some of his strategies (such as his tendency to produce multiple copies of his pictures), yet since his death his reputation has only improved. Conceptual artists have admired his use of text in images, and painters in the 1980s admired the provocative kitsch of some of his later work. Magritte wished to cultivate an approach that avoided the stylistic distractions of most modern painting. While some French Surrealists experimented with new techniques, Magritte settled on a deadpan, illustrative technique that clearly articulated the content of his pictures. Repetition was an important strategy for Magritte, informing not only his handling of motifs within individual pictures, but also encouraging him to produce multiple copies of some of his greatest works. His interest in the idea may have come in part from Freudian psychoanalysis, for which repetition is a sign of trauma. But his work in commercial art may have also played a role in prompting him to question the conventional modernist belief in the unique, original work of art. The illustrative quality of Magritte's pictures often results in a powerful paradox: images that are beautiful in their clarity and simplicity, but which also provoke unsettling thoughts. They seem to declare that they hide no mystery, and yet they are also marvelously strange. As Magritte biographer David Sylvester brilliantly described, his paintings induce "the sort of awe felt in an eclipse." Magritte was fascinated by the interactions of textual and visual signs, and some of his most famous pictures employ both words and images. While those pictures often share the air of mystery that characterizes much of his Surrealist work, they often seem motivated more by a spirit of rational enquiry - and wonder - at the misunderstandings that can lurk in language. 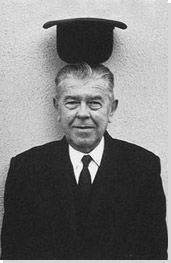 The men in bowler hats that often appear in Magritte's pictures can be interpreted as self-portraits. Portrayals of the artist's wife, Georgette, are also common in his work, as are glimpses of the couple's modest Brussels apartment. Although this might suggest autobiographical content in Magritte's pictures, it more likely points to the commonplace sources of his inspiration. It is as if he believed that we need not look far for the mysterious, since it lurks everywhere in the most conventional of lives. This elegant work is a fine example of Magritte's early attempts to find a restrained, illustrative style. It bears comparison with contemporary Belgian Expressionism and also with the classicizing modernist styles that were then popular throughout Europe. We can recognize many of the elements that characterized his later paintings, such as the prominence of the sea and the mysterious sphere in the background. This work also bears the influence of Magritte's professional forays into the world of fashion advertising, and his interest in the works of Fernand Léger. Bather can be compared to his painting The Bather between Light and Darkness (1935-36), which explores the same scene in the artist's mature style. In 1930, the artist gifted the picture to his sister-in-law, Leontine Berger. Here, the viewer is confronted by five men - or perhaps five views of the same man - each corresponding to a seemingly random object. These bland portraits with indistinct clothes, features, and expressions are characteristic of Magritte. The objects, on the other hand, are unique and command more attention than the figures who stare blankly at them. Several pictures that predate this attest to Magritte's interest in depicting objects in his work, but this is the first in which the objects appear alongside figures and are associated with the mental states of those figures. In this regard it shows the artist's growing interest in the Surrealist idea of the unconscious. Magritte's way of placing the objects in relation to the figures also enabled him to partially occlude their faces, a strategy which he would often employ in later work. The Treachery of Images cleverly highlights the gap between language and meaning. Magritte combined the words and image in such a fashion that he forces us to question the importance of the sentence and the word. "Pipe," for instance, is no more an actual pipe than a picture of a pipe can be smoked. Magritte likely borrowed the pipe motif from Le Corbusier's book Vers une architecture (1923), since he was an admirer of the architect and painter, but he may also have been inspired by a comical sign he knew in an art gallery, which read, "Ceci n'est pas de l'Art." The painting is the subject of a famous book-length analysis by Michel Foucault. One might also compare it with Joseph Kosuth's handling of a similar problem of image, text, and reality in his 1965 installation One and Three Chairs. The bright colors and casual brushwork of The Ocean typifies a series of satirical pictures Magritte painted in the style of late Pierre-Auguste Renoir, whose pictures were intended to mock the conservative tastes of the French public. The pose of the river god in this picture borrows directly from a late work by Renoir. As the Second World War drew to a close, he turned away from the more macabre subjects of Surrealism and embraced a radiant palette and, as he put it, "bewitching subjects." The artist wrote that he wanted to paint pictures "that will arouse what remains of our instinct for pleasure." Three years later in 1946, he signed the manifesto Surrealism in Full Sunlight that his Belgian friends had written to outline such principles. But the pictures in this style attracted considerable criticism from his Surrealist friends. The Pebble was included in Magritte's first Paris exhibition in 1948, where he shocked critics and public alike with an uncharacteristic group of his "vache" works. This group of around thirty pictures was painted rapidly in only a few weeks. It borrowed from the sketchy style of comics and caricatures, but some elements were also derived from Édouard Manet and Fauvism (the background in this picture may come from Henri Matisse). It also borrows the Venus de Milo motif that Magritte had used before. Perhaps unfortunately for the artist, the exhibition achieved its perverse effect, and was both financially and critically devastating to him. However, he remained attached to the work, and later gave this piece to his wife. The Empire of Light exemplifies the sort of simple paradox that characterizes Magritte's most successful works. Dusk has fallen in the bottom half of the picture and a streetlamp glows peacefully. Above, cheerful white clouds hang in a baby-blue sky. Although both elements of night and day are calming and lovely considered on their own, their juxtaposition is eerie and unnerving. As Magritte once said of Max Ernst's and Giorgio de Chirico's work, the darker statement similarly applies to strains of Magritte's own work: "the spectator might recognize his own isolation and hear the silence of the world." The overall impression of this scene is one that powerfully stays in the mind of the viewer.